I have always struggled with anxiety my whole life. I have always feared rejection and the opinions of others. I will probably continue to struggle with these anxieties, (and depression) for the rest of my mortal life. But that does not mean that I can let it define or control me. That does not mean that I will hide my light and suffocate my voice. My posts are not meant to offend people, they are not designed to condemn or judge people for the choices they have made, are making or have yet to make. If it comes across that way then I do apologise for that. I understand that every person on this planet is going through their own experiences, and I can never hope to know what is inside your heart, mind and soul. But my intention is one of love, respect and peace for all life on earth. Your past is in the past. What matters most is the choices you make from this moment forward. All I aim to do is teach and encourage people to make better, more loving and more informed choices from this moment forward. The only person who has the power and authority to judge my heart, mind and soul, and everyone else for that matter, is God. It is in Him I trust. I pray daily that I may share with others what He would have me share. I pray daily that I can word it in such a way that is as loving and as kind as it can be without watering down my own beliefs, without going against my own conscience, and without stifling my own soul. Societal standards do not always reflect God’s standards. The truth is painful and offensive to those who rebel against it, and I would rather be condemned by society for sharing my beliefs than be condemned by God for not doing so. Even though I was raised, from birth, in The Church of Jesus Christ of Latter-day Saints, and taught the gospel, I still had to do my own soul searching to know for myself whether or not it was true. I am not a sheep who blindly follows, in fact I am against that very thing, but I have prayed about it, with a sincere desire to know of truth and to act on truth. Everything in life revolves around faith. In religion, in science, in humanity, the basic principle remains the same. You have faith in something or someone. And until science can definitively prove, without any shadow of a doubt, with no evidence to the contrary, that there is no God, then I shall continue to believe. We are fighting a spiritual war and whether you believe it, or not, it does not change the truth. Whether you know it, or not, we are all warriors in spirit. But whose side are you on? God’s or the Devil’s? People say “ignorance is bliss” but I believe that “knowledge is power”. You cannot fight an enemy that you know nothing about. You cannot fight an enemy that you do not even believe in. How do you come to know for yourself? You search the scriptures and pray about them. You seek with real intent, a real, genuine desire to learn of and act on truth, and then you act on it. And if you do not wish to act on truth, then you simply don’t ask for it to be revealed to you. Because it cannot be revealed to you if you do not first have a genuine desire. What would be the point? 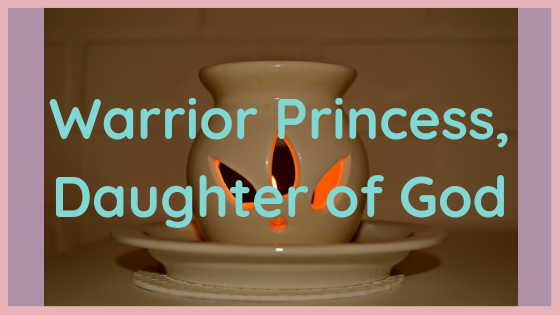 As a follower of Jesus Christ, as a Warrior Princess (or Prince) in Spirit, a devoted daughter (or son) of God, you will experience many challenges. Your beliefs and standards will differ greatly from that of society. You will stand out and people may hate you, your words and way of life. It can be a lonely experience at times. You can feel afraid to share your own beliefs because of what others may think of them, because of the potential of persecution for your beliefs. And this is precisely the reason why you need to stand up for what you believe in, so that others may have the courage to do the same. This is the whole point of life. To learn and to grow. We must have opposition in all things if we are to learn to rise above it. We cannot know happiness if we have never experienced sadness. We cannot know right from wrong if we have never experienced one or the other. It is in how we respond to opposition that defines who we are as individuals. It is in the conviction of our beliefs and sharing them that defines who we are as individuals. It is our integrity, to be consistent in our beliefs, in mind, body and spirit, that define who we are as individuals. Freedom of choice, love, kindness, empathy, respect and peace are things I value most. I try my best not to come across as judgemental and critical of others’ choices. I am only human and so I will fail and I will fall, from time to time, but I will always try to get back up again. I always try to learn and to grow from everything in my life. I am trying to make this world a better place for all life on earth. I apologise for any offence that it may cause. 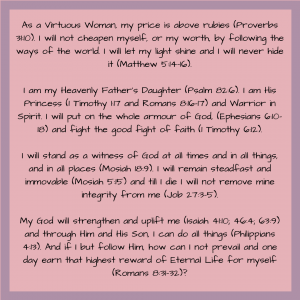 As a Virtuous Woman, my price is above rubies (Proverbs 31:10). I will not cheapen myself, or my worth, by following the ways of the world. I will let my light shine and I will never hide it (Matthew 5:14-16). I am my Heavenly Father’s Daughter (Psalm 82:6). 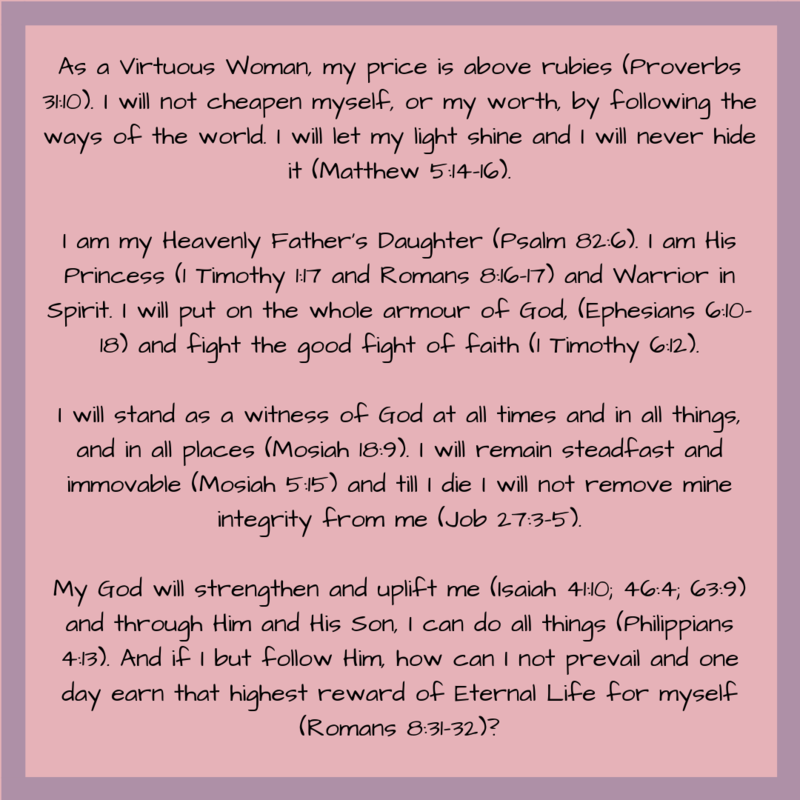 I am His Princess (1 Timothy 1:17 and Romans 8:16-17) and Warrior in Spirit. I will put on the whole armour of God, (Ephesians 6:10-18) and fight the good fight of faith (1 Timothy 6:12). I will stand as a witness of God at all times and in all things, and in all places (Mosiah 18:9). I will remain steadfast and immovable (Mosiah 5:15) and till I die I will not remove mine integrity from me (Job 27:3-5). My God will strengthen and uplift me (Isaiah 41:10; 46:4; 63:9) and through Him and His Son, I can do all things (Philippians 4:13). And if I but follow Him, how can I not prevail and one day earn that highest reward of Eternal Life for myself (Romans 8:31-32)? So, when you feel as strongly as I do, you cannot allow yourself to hide your beliefs out of fear. When you feel as strongly as I do, you want others to share in the spiritual truths you have learned for yourself. At the end of the day, we all have the freedom to choose our beliefs and actions but not our consequences. I respect your choices, as I hope you respect mine, but I cannot allow myself to not share my beliefs, for I am concerned about the welfare of your soul, as cheesy or delusional (take your pick) as it may sound. One day, the truth will be made known to everyone (Romans 14:7-12) and every single one of us will be held accountable, for our own actions, before the judgement seat of God. An October 2010, General Conference talk that resonates with me, aimed at women but applicable for all, is “Steadfast and Immovable” by Silvia H. Allred, First Counselor in the Relief Society General Presidency.